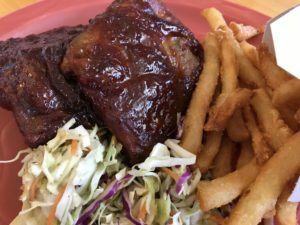 Hali’imaile General Store shares recipe: Summertime is for BBQ’S! 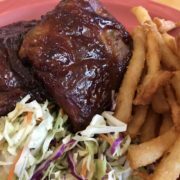 Hali’imaile General Store is excited to share a delicious summer recipe perfect for your summertime BBQ plans. You can find more delicious recipes in Bev’s “Family Style Meals” cookbook. Firing up that grill? Why not add Bev Gannon’s signature barbecue sauce to your grill items? To prepare the sauce, in a heavy saucepan, melt the margarine over medium heat. Add the onions and sauté for 5 to 6 minutes, until translucent. Add all the remaining ingredients, stir to blend and bring to a boil. https://hgsmaui.com/wp-content/blogs.dir/5/files/2017/07/lunch-ribs.jpg 3024 4032 bootziegirl https://hgsmaui.com/wp-content/blogs.dir/5/files/2015/06/HGS-25Yr-Logo1-300x180.jpg bootziegirl2017-07-15 02:11:422017-07-15 02:11:42Hali'imaile General Store shares recipe: Summertime is for BBQ'S! 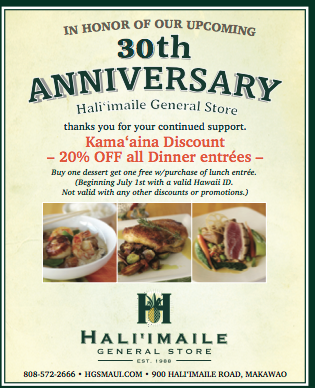 Hali’imaile General Store announces a fantastic Kama’aina discount that begins July 1st 2017. 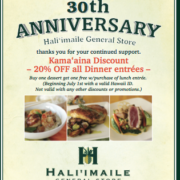 This discount is valid with a Hawaii State ID. The discount for local residents includes 20% off of dinner entrees and buy one dessert get one free with purchase of a lunch entree. This offer is not valid with any other promotions or discounts.